Prospective student Raisa Jarostchuk, 16, (right) and mother Karen Jarostchuk, (center) spoke with recruiter Michael Benincasa of Queens University, during the EduCanada fair, held at the International School of Boston. CAMBRIDGE — In a sweaty high school gymnasium on a recent Monday evening, 25 college recruiters set up tables with glossy brochures and free pens. Among them were Quest University, Mount Allison University, the University of Waterloo, and Bishop’s University. Most Americans can’t locate these schools on a map (hint: they’re all in Canada), but nonetheless about 100 US students and their parents attended the fair, curious to learn about them. Why? The lure of reasonably priced tuition and a chance to study outside the United States. As private college costs in the United States creep ever-closer to $70,000 a year, Canadian schools are seizing on unprecedented interest among Americans increasingly unwilling to accept mountains of debt for an undergraduate degree. Colleges in Canada, which are almost all public and receive more government support than their US counterparts, are significantly cheaper, as little as $8,000 per year at Brandon University in Manitoba, or $15,000 at McGill, in Montreal. And these days, Canadian college recruiters say, there’s another dynamic at play: Some US students disenchanted with American politics since Donald Trump’s election last fall are exploring higher education far from home. “It’s definitely a reason why they’re leaving,” said Mariya Kala, a recruiter from the University of Toronto. Toronto, the nation’s largest and most elite university, saw 795 more applications from US students this year than last year, a 75 percent increase. Last year, 125 Americans enrolled; this year that number is 222, a 78 percent increase. Nationwide, 6,349 Americans held Canadian study permits in 2016, up from 5,683 the year before. The government considers international students a tool for economic growth and welcomes them to work and live in Canada permanently after they graduate. At the college fair in Cambridge last week, students asked Kala about Toronto’s admissions requirements, which like most Canadian schools do not include an essay, teacher recommendations, or an interview. Students simply submit a transcript and an SAT or ACT score. Raisa Jarostchuk, an 11th-grader at Wellesley High School, told Kala she wants to study business and marketing, and Kala described programs she could choose. Her mother, Karen, was fixated on the price, which at $36,000 per year is among the most expensive international rates in Canada. “That’s still reasonable,” Karen said. Her other daughter attends Boston University, which this year costs $67,000 including room and board. None of Jarostchuk’s classmates are talking about Canadian schools. She found them herself by Googling for colleges that match her three criteria: happy students, a place to practice French, and a good price. Price is the biggest factor. “I don’t want to live my life in debt,” she said. Canadian colleges have tried to attract American applicants for years and so has the Canadian government. The Consulate General of Canada in Boston organized Monday night’s fair, held at the International School of Boston, a French language International Baccalaureate school. 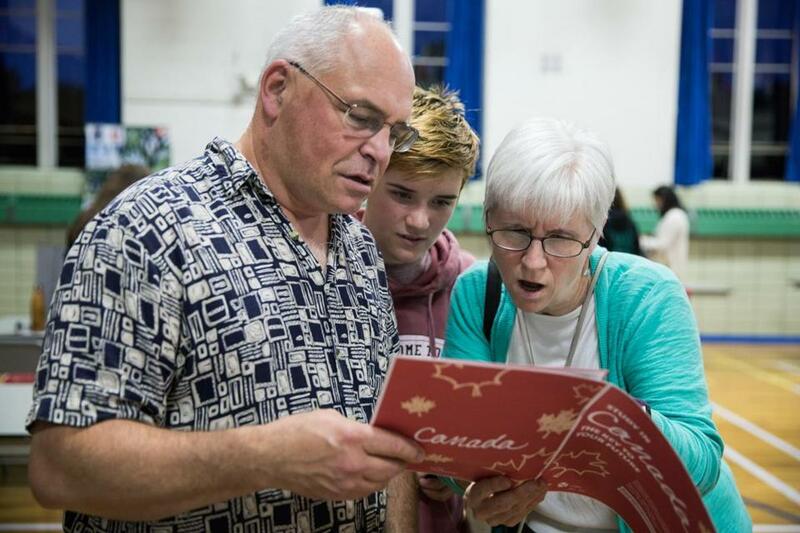 From left to right: Dan Taylor, Rebecca Taylor, 16, and Joan Smith, examined a EduCanada booklet at the EduCanada fair held at the International School of Boston. Kala has recruited for Toronto since 2011 but in the United States only since last year. Her position is a two-year pilot to focus on New York, California, and Massachusetts, the school’s top feeder states. Other Canadian schools have also added to their US recruitment teams this year to handle the interest. Until now, their success has been modest. But after Trump’s election, colleges across Canada saw an unprecedented rise in website traffic from the United States and a corresponding increase in applications. The pamphlet for Bishop’s University, a 2,500-student school in Quebec that costs $16,000 a year for international students, bore the slogan “Look North.” The school saw a 200 percent increase in American applications and ultimately welcomed 72 US students last year, a record according to recruiter Eddie Pomykala. “That’s not just because of the political situation here, there’s a lot of factors,” Pomykala said. There are already about 800 American students at Toronto, about half of them undergraduates. They say they like going to school in the lakeside city, which feels culturally different but not entirely foreign. They like Toronto’s diversity and the freedom of knowing they will not spend their lives in debt. 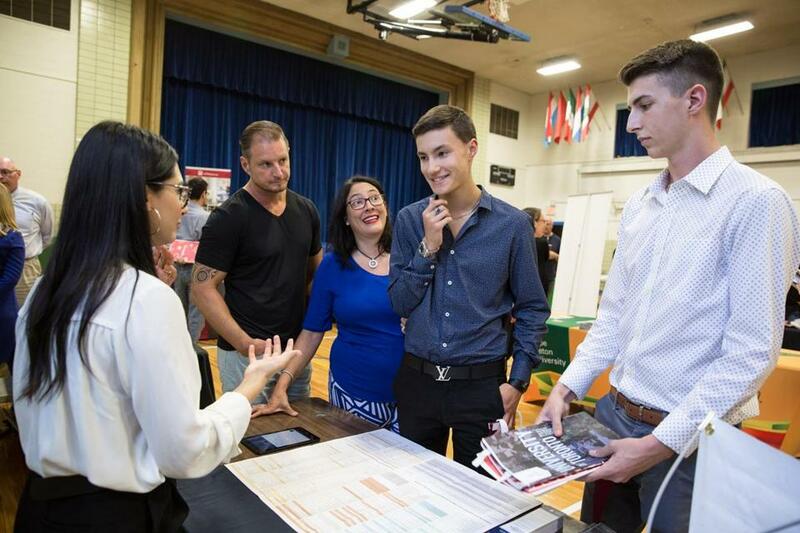 From left to right: Mariya Kala, recruiter from the University of Toronto, talked with Jon Bowers, Lina Bowers, Jonathan Bowers, 17, and Zeth Oakes, 17, about what the school has to offer during the EduCanada fair. But choosing a school based on price is not an easy decision. It took Eva Bodin, a second-year from Middlesex, Vt., months to adjust to the idea. She had always dreamed of going to Northeastern University in Boston. Northeastern accepted her, she said, and she made a deposit, but she never made it to Huntington Avenue. Northeastern costs about $67,000 a year and offered her $1,000 annually in financial aid, she said. But Bodin’s mother is half-Canadian, so Bodin is eligible to pay Canadian tuition at Toronto, which is about $6,000 per year. “I feel so happy to be here, not having to spend the rest of my life paying off debt,” Bodin said. Why are Canadian colleges so much cheaper? Mainly because almost all of them are public. Government aid comes primarily from the provinces and some schools receive as much as 80.5 percent of their operating budget from the province, according to a report by CAUBO, a nonprofit professional organization representing financial administrators of Canadian colleges. As in the United States, government support for Canadian colleges is declining, but the level of support in the United States is lower. Tuition at public colleges and universities in the United States accounts for about 47 percent of their total funding, up from 26 percent in 1991, according to a 2016 report on state higher education finance published by SHEEO, a national association of public higher education officials. Even as US students enjoy the independence of navigating college life in another country, many said being American in Canada carries new weight since Trump’s election. Canadians love to talk American politics, but in the same way they might discuss hockey, students said. Many laugh when they wonder how the United States could have elected a reality television star. Bodin, from Vermont, remembers the day after Trump’s election. She was at a political science lecture in one of the school’s largest auditoriums. The professor mentioned Trump’s name and the room burst into laughter. “I’m sitting in a room of 1,300 people just laughing at Americans,” she said. Other students feel guilty for having found a way to escape. As she scrolls through her Facebook feed, Konstantina Nikolakis, a second-year from Winchester sees posts from friends in the United States, and part of her wishes she was protesting Trump alongside them. Back in the Cambridge high school, Marc Jacques from the Canadian consulate’s office packed up his sign-in list and recalled the years when he first started recruiting in the United States. In 2004, he said, not even high school college counselors here had heard of Canadian colleges. He doesn’t chalk up this recent bump to Trump entirely, or to tuition prices, but to the effort he and others have put in for years, and the quality of the schools they represent. Whatever the reason, he said, Canada is the winner. The country’s population is declining, and it sees students as an ideal way to create new Canadians.